Over ten years ago now, we had an idea: with all of the data clients were collecting about customers and their behavior, maybe they could use some of it to personalize their email. Today, various forms of behavioral based personalization and targeting have become more widespread –all based on a common principle: your customers know what they want from your brand much better than you do. It’s great to see that after all these years, marketers are moving away from stale, more academic models of how ideal consumers are “supposed” to react and replacing them with constantly changing models based on actual user behavior and reactions. It’s a much more organic system, and the results of making the switch are huge. Email in particular sees strong benefits from behavior-based personalization. In a study posted on DMNews.com, an overview of the email marketing space shows that the top performing companies, all of which use heavy personalization and behavior-based segmentation, have average click-through rates of 16.6%, or over three times the overall average. Just to put that number in perspective, 16.6% is higher than average open rates in many verticals. Some other key findings from the study point to the changing face of email marketing, and specifically email marketing results tracking. Open rates, for instance, are down almost 7%, from 21.3% to 19.9%. Most of this shift, however, is attributed to the increased use of image-blocking software in email clients, making emails hard to track. We, along with most veteran email marketers, have been cautioning people not to use open rates as a measure of success for quite a while now, and this sharp drop goes a long way to reaffirm that warning. Open rates are simply not a good measure of the success or failure of an email campaign. Click-through rates, on the other hand, are a great performance indicator. No matter what kind of image-blocking software an email client may have, if a customer clicks on a link, most often it is going to be recorded. The study found that click-through rates have been steadily increasing since 2009, showing the highest gains with those email marketers that have a strong focus on tracking and responding to user behavior. Some other reasons cited for the increased click-through rates include the rise of email marketing automation systems and lifecycle marketing. These systems are the ultimate segmentation and personalization tools, since when designed well, they target customers precisely on the actions they take shortly after they take them. It’s important to note, again, how different the trends look for open rates and click-through rates. Many marketers still use open rates as a metric of success, and base budgeting and strategy decisions on these numbers. While open rates effectively address the viability of a list, and is a benchmark that tells us if the list has a most basic level of potential, this is not recommended. Open says nothing about monetary value of a program. Ideally, we would like to see all email marketers move away from open rates as an objective measure of performance and use it only when comparing results of two very similar campaigns (such as in the case of an A/B test). Instead, we would strongly urge all email marketers to begin looking at downstream metrics for calculating performance. Click-through rates are a reasonable indicator, but even they don’t go far enough. What marketers really need to start focusing on are numbers like revenue per email and bottom line holistic conversion rates that track from the moment an email is sent to the time a customer converts or makes a purchase. Overall, the trends look very positive for email. 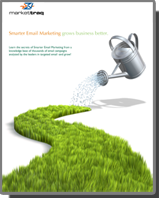 It looks like as the market changes and as the tools that email marketers use grow and mature, email metrics can continue to improve. Organizations that won’t or can’t get past the standard email blast template, on the other hand, are going to see rapidly diminishing returns on their email marketing investments.